ShowThrow Ribbon Quilts and Wall-hangings are custom quilted to follow the carefully folded seams in the overall pattern. They have a thin cotton batting, beige paisley cotton backing, a custom printed ribbon binding and can have tabs added for hanging on a rod. A folded strip of ribbon can be added to the bottom for hanging additional ribbons. When planning your order please feel free to call me with any questions you have regarding the process. It is helpful if, before calling, you have read the information on this page, taken time to brouse my galleries, and printed an Order Form. 1. Roughly how many ribbons do you have? 2. How long are most of your ribbons? 3. Which colors do you have the most of? 4. Do you have a size or price limit? 5. Do you want space on the finished quilt to hang favorite rosette tops? The cost of a small ribbon quilt is in line with the cost of any other comparably sized wall art, the cost of a medium ribbon quilt is less than spending just one weekend away at a horse show, and the cost of a large ribbon quilt is usually less than the cost of buying a new saddle. Meanwhile, your custom ribbon quilt offers style, sentimentality, and longetivity that exceeds any of the aforementioned. As you sort your ribbons please do not iron them. I'm not optimistic about the longevity and durability of your quilt if the ribbons have been ironed. I have found that ironing makes the ribbons brittle, fragile, and crooked and prefer to quilt without ironing. Please, trust that they will be fine, even after years of storage, once they have been smoothed by hand and sewn flat. Please be sure to look at the quilt galleries with some attention paid to the size you are most likely to order. Feel free to create a list of your favorite quilts on the back of your Order Form. Many customers write why they like a particular quilt (borders, color arrangement, pattern of star blades and/or corners, dark/light back ground, etc.). If you have a size or price limit please be sure to indicate that in the Price/Size limit box of your order form. I will do my best not to exceed any price or size limit set; otherwise I keep working until I have used most of the ribbons. I have had numerous questions regarding how to calculate square footage (width’ x height’ = total square feet). For example, if you want a small quilt, roughly 5’ by 5’ then 5’ x 5’= 25 sqft and $750.00. The following table should help you to determine how large your quilt can be based on the number of ribbons available and how much it may cost. This can only be an estimate and cannot be used for the purpose of a direct quote because the pattern selected can result in tightly packed ribbons, or because this table is based on 2 x 8 ” ribbons, yours may be longer, adding to the square footage of the finished quilt. Star patterns typically result in slightly greater square footage than what is indicated in this table. After you have selected a product and a pattern you will send your ribbons to me using the address provided on the order form. Tuck your order form and any notes you have for me with the ribbons inside a bag and then a sturdy box; don't be shy with the tape - you don't want the box bursting open! Please, no packing peanuts or bubble wrap - ribbons are precious but they are not fragile! I will call to inform you of their safe arrival. Do not ship via the USPS - they refuse to deliver to my house because I have (harmless) dogs (sleeping on my porch); additionally, they leave my packages at the street where they could be stolen or rained on! During their time with me, your ribbons will be carefully handled in my smoke-free and pet-free home so as not to get wrinkled or dirty until used. In general, the best time to ship your Christmas order is in July and the best time for Graduation orders is January-February. In doing so, you avoid any rush and also get your order onto my table when I am spending the most time there due to extreme hot or cold weather outdoors. Sadly there are many more gals earning ribbons than staying at home sewing ribbon quilts! The wait from when I receive your ribbons to beginning your quilt is currently 1 month. If you require your quilt in four weeks or less, I require advance payment for the project plus a $100 rush fee to cover any additional size and the inconveniece and expense of rushing the order. "By Christmas Guaranteed" orders must be received by November 1. Your ribbons are counted to make a design plan and handled with care throughout the entire process. If your order form is unclear I will call you a couple of days before I begin so that you can review the website, make changes to your order, and discuss my recommendations or concerns surrounding the project. The ribbons are then carefully cut and sewn one-by-one to avoid cutting more than will be used in the project. I am very careful to use your ribbons appropriately by their size and prestige. Unused ribbons will be returned along with champion, reserve, and select 1st-3rd rosette tops (others can be returned at an additional shipping/labor charge as indicated on the order form). After the top has been created you will be sent a photo by email. You must pay half of the total cost and may be asked to make some decisions about the finished project. 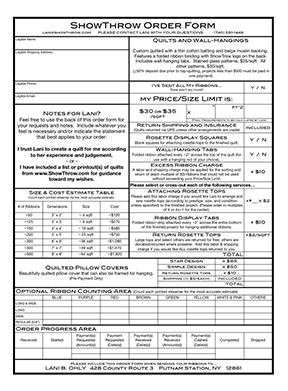 If your quilt is under $500.00 you will be asked to pay in one payment (these take only one day for me to finish and prepare for shipping if I haven't already) - if you don't pay in one payment I may presume that you are under some financial strain and will refrain from rebilling until my next billing "round-up" (about once per month). If you need your project for Christmas, a birthday, or graduation you should pay in one payment. Once your deposit has cleared it may be 2 weeks before a final bill and photo are sent depending on the size of the quilt. Quilts and Wall-Hangings are top quilted with a thin cotton batting and beige paisley cotton backing and are finished ("bound") with blue or red folded ribbon which is custom printed (as pictured above) with my "signature". Lastly the projects are returned home via UPS 7-10 days following final payment, and are insured for the cost of the project only. If other arrangements need to be made please put this on the back of your order form. Ribbon quilts should never be washed, dry-cleaned, or ironed; they can be spot cleaned gently with a soft, damp cloth. As with all handmade, heirloom quality quilts, they should never be stored in plastic for the long-term because of the harmful chemicals emitted by all plastic materials and because plastics do not allow the fabric to breathe. To keep the colors from fading and the ribbons from deteriorating they should not be hung or placed in direct sunlight. All handmade quilts are made to higher standards than any commercial quilt on the market but, in order to last multiple lifetimes (as a family heirloom) they should not be sat on (especially while in use on a bed) because knees and elbows stretch and strain the threads, fibers in the ribbons, etc. Finally, if you spot a loose thread, snip it carefully - don't pull it. 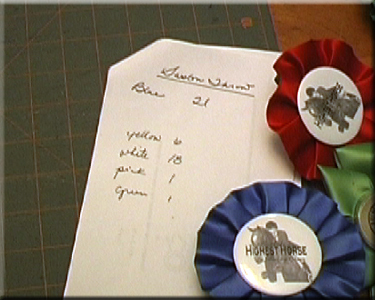 If you want to put your quilt or pillow to work at horse shows, on the couch, or any other place where it will experience wear, that is fine from a structural standpoint, but it cannot be expected to retain the gold writing for more than a few years and will begin to show structural wear from 5-10 years depending upon how heavily it is used and the age and quality of ribbons used to build it. I sew with extremely tiny seam allowances in order to show off as much of the writing as possible (1/8" vs. the standard 1/4") and this may hinder the quilt's ability to absorb the strain of knees and elbows.